Below is the confession of Thomas Colley who was found guilty of the murder of Ruth Osborne, a purported witch. How much Thomas had to do with the death is unclear. It seems likely that he was involved in the ducking of Ruth at a late stage and became a scape-goat for the real ring leaders. Ruth Osborne and John, her husband, were paupers and so very vulnerable. 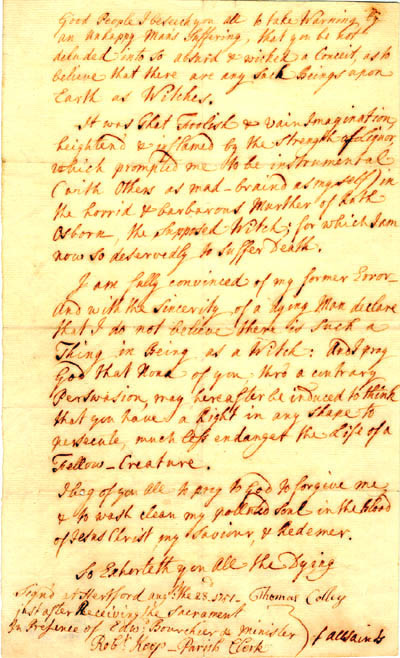 In late April, 1751, after the pair had been refused food by a farmer, he and his cattle became ill. Ruth had been seen muttering at the farmer and so was considered responsible. She was branded as a witch and John as a wizard. On 22nd April, a mob of local people decided to duck Ruth and her husband to “prove” the idea. They had problems finding the two and there was a riot at Tring Workhouse. Eventually they took Ruth and John from Tring Church. Not surprisingly Ruth died as a result of the ducking and Thomas Colley, who had been drinking in a local hostelry, seems to have become involved towards the end of the ducking. It is interesting that Ruth was the one who was attacked first and as a result died whilst her husband, John, lived. Does this say something about the place of women in 18th Century society? Thomas Colley was a chimney sweep in the Tring area and spent much of his time, when he was not engaged in this activity, drinking in the local hostelries. Shortly after the death, Thomas was taken into custody, tried and found guilty, along with two others, at Hertford. None of the ringleaders of the riot were ever identified: it seems that the witnesses at the trial were too frightened to name anyone. Whether, because he was so drunk, he thought he was more responsible then he probably was and therefore felt great remorse, or he was forced to write the confession we will never know. Whatever the reason, he wrote it in a clear hand in front of reputable witnesses. Afterwards he was returned to the Tring area where, in late August, he was executed at Gubblecote. There does remain the question of why the authorities did not take action at any stage, especially as the threatened ducking was well publicised and a large mob congregated outside Tring Workhouse. Good People I beseech you all to take Warning, by an Unhappy Man’s Suffering, that you be not deluded into so absurd & wicked a Conceit, as to believe that there are any such Beings upon Earth as Witches. It was that Foolish and vain Imagination, heightened and inflamed by the strength of Liquor, which prompted me to be instrumental (with others as mad-brained as myself) in the horrid & barbarous Murther of Ruth Osborn, the supposed Witch; for which I am now so deservedly to suffer Death. I am fully convinced of my former Error and with the sincerity of a dying Man declare that I do not believe there is such a Thing in Being as a Witch: and I pray God that none of you thro’ a contrary Persuasion, may hereafter be induced to think that you have a Right in any shape to persecute, much less endanger the Life of a Fellow-Creature. I beg of you all to pray to God to forgive me & to wash clean my polluted Soul in the Blood of Jesus Christ my Saviour & Redeemer. This page was added on 05/08/2011.